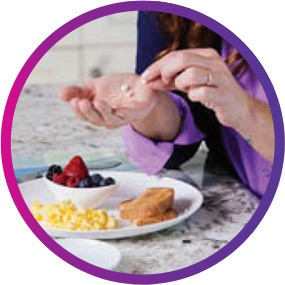 Five different dose strengths, and the option for either twice-daily or 3-times-daily dosing, allow your doctor more flexibility in finding the exact dose combination that is right for you. Your dose will be adjusted over time. This will be based on what works best for your PAH symptoms and how you tolerate taking Orenitram. Orenitram should be taken with food. Take Orenitram exactly as prescribed by your healthcare provider. If you miss a dose of Orenitram, take the dose as soon as possible with food. If you miss 2 or more doses, call your healthcare provider for instructions. Looking for more information about Orenitram? 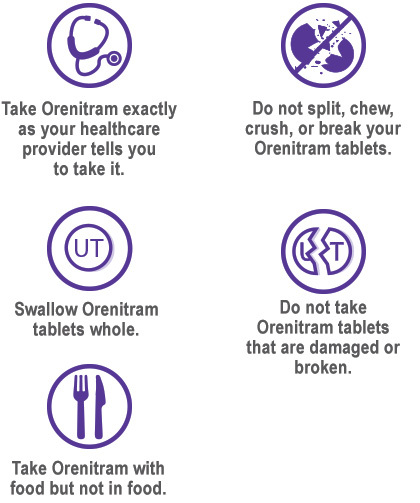 Learn what you need to know about Orenitram, including dosing information and food ideas. Watch the full video or select the topic that most interests you. Setting goals is an important part of your treatment. Your healthcare provider can help you figure out what goals are appropriate for you. They may be related to your daily life or to your ability to enjoy activities with loved ones. Keep track of how you feel after taking your medication, as well as what combination of foods you took along with your medication. Use these notes to discuss how you are feeling with your healthcare provider. Use the Treatment Diary to record your daily Orenitram routine, and share your notes with your healthcare team so they can help guide your treatment. For additional information, please see Patient Information for Orenitram. Do not change your dose or suddenly stop taking Orenitram without first talking to your healthcare provider. Stopping Orenitram suddenly may cause your PAH symptoms to worsen. You may see the tablet shell in your stools (bowel movements). This is normal. The tablet shell is not digested. If you have diverticulosis, Orenitram tablets can lodge in a diverticulum in your intestine.